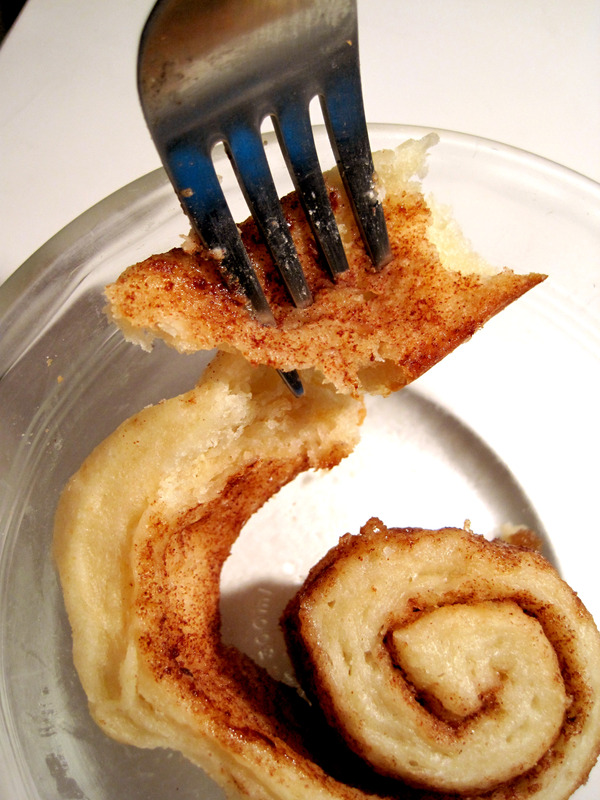 Cinnamon rolls isn’t really by any measure a healthy breakfast, but somehow this carbohydrate bomb managed to enter the canon of breakfast foods. I suspect it’s because it’s so fun to eat. Who doesn’t like eating the cinnamon roll by unwrapping it toilet paper-esque? 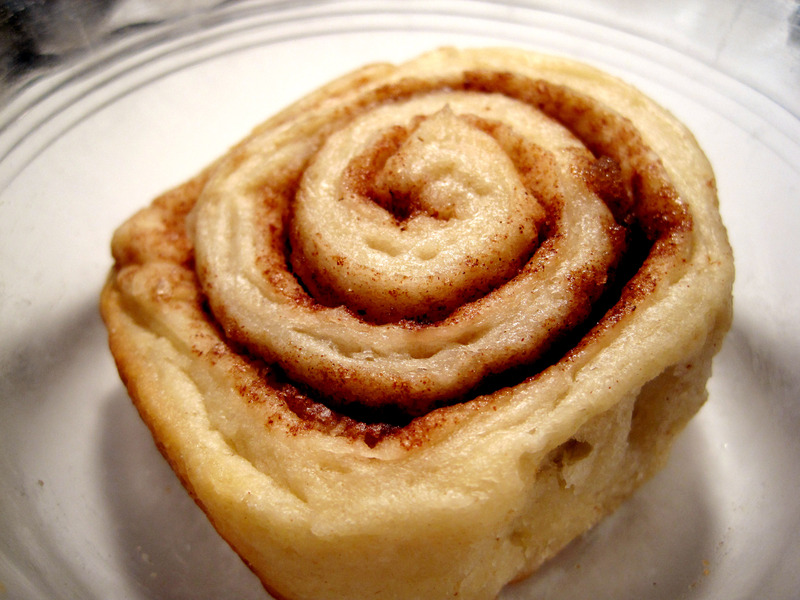 Okay, my metaphors and similes haven’t been very appetizing but my words embody my feelings towards cinnamon rolls – nay, the whole plethora of desserts! They are so fun to eat, and the soft fluffiness of the bread and caramelly cinnamon-sugar glaze simply brings you to a state of unadulterated, comforting pleasure. Furthermore, its inherent playfulness makes eating a tactile experience as well. Ok, I’m done with the romanticizing. Onto the recipe now. 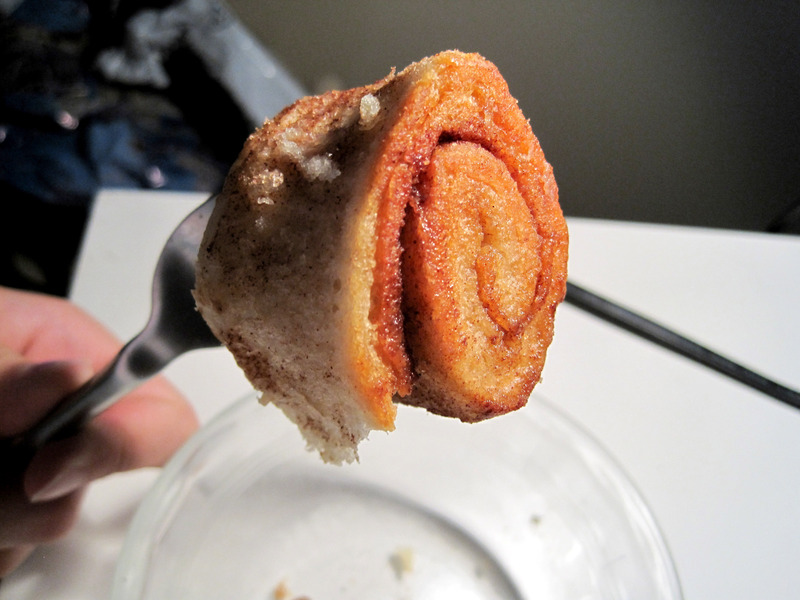 Some things to note: the roll without the glaze isn’t terribly sweet, so if you want your desserts to be unabashedly sweet, be sure to use the glaze or up the cinnamon-sugar mix. This recipe is also really easy for a yeast-bread one, since you can make it the night before and bake it in the morning for a freshly-baked and oh-so-sinful breakfast. Beat eggs in medium size bowl. Add 3/4 cup warm water and yeast, stirring to dissolve yeast. Refrigerate mixture for 10 minutes. In a bowl, mix together the brown sugar and cinnamon. Brush the dough with melted butter and sprinkle with the sugar mixture, leaving a 1-inch border. Roll the dough up to form a jelly roll. With a serrated knife, cut the roll into 1-inch slices. Place on a greased baking sheet and allow to rise in a warm place about 30 minutes. Generously sprinkle with the granulated sugar (I skipped this step). Bake in a pre-heated 350°F oven for 25-30 minutes. Allow rolls to cool slightly on wire racks placed over wax paper.